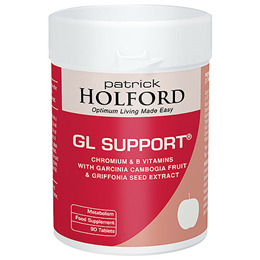 GL Support combines the three nutrients recommended by Patrick Holford as part of the Holford Diet - Garcinia Cambogia (tamarind fruit), 5-HTP (5-Hydroxytryptophan) and Chromium. Chromium picolinate is a natural-source form of chromium that provides two major ingredients of the glucose tolerance factor - chromium and niacin (nicotinic acid). These ingredients may assist the body`s natural management of fats and carbohydrates. GL Support may assist weight loss when used as part of a calorie controlled LOW GL diet and sensible exercise regime. Garcinia cambogia powder, Bulking Agent (Microcrystalline Cellulose), Griffonia simplifica seed Extract (providing 5-HTP), Vitamin B6 (as Pyridoxine Hydrochloride), Niacin (Vitamin B3 as Nicotinamide), Thiamine (Vitamin B1 as Thiamine Hydrochloride), Anti-caking Agent (Magnesium Stearate), Riboflavin (Vitamin B2), tablet coating (vegetable protein), Chromium Picolinate, Folic Acid, Vitamin B12 (as Cyanocobalamin). One tablet taken three times daily either before food, or on an empty stomach, or with a starchy meal or snack, or as professionally directed. Long term intakes of amounts greater than 10mg of vitamin B6 daily may lead to mild tingling and numbness. Below are reviews of GL Support - Garcinia Cambogia - 90 Tablets by bodykind customers. If you have tried this product we'd love to hear what you think so please leave a review. 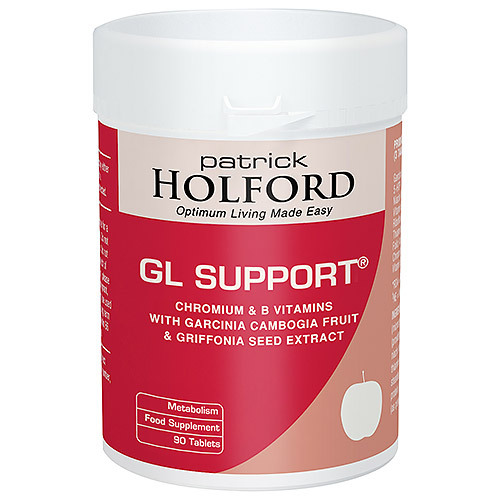 GL Support combines the three nutrients recommended by Patrick Holford as part of the Holford Diet - Garcinia Cambogia, 5-HTP and Chromium. GL Support may assist weight loss when used as part of a calorie controlled LOW GL diet.